Besides the default language keyboard on iPad, you can more different language international keyboards to your iPad. This allows you to type text in other different foreign languages, even some languages written from right to left of the screen. You can check full list of supported keyboard for your iPad on the settings screen. 1. Tap ‘Settings’ icon on the iPad home screen. 2. Then tap ‘General’ option and goto International > Keyboards > Add New Keyboard. 3. Turn ON the keyboard of your choice with specific language preference. 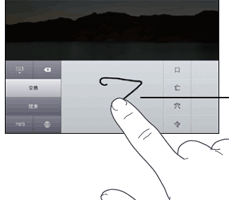 It supports lot of languages including Japanese, Chinese Handwriting, Chinese Pinyin and more. While using Chinese Handwriting language keyboard, you can draw symbol with finger and matching characters will be shown for quick selection and typing. How about Sakha language ? Looking forward for Sakha language keyboard and dictionary appear in my iPad2. What about the Klingon keyboard? how do i do the korean language? its not on here!!! Have loaded the Portuguese keyboard, but other than the “return” key becoming the “retorno” key, nothing is changed. There is no “ç.” Nor is there”ã.” I don’t get it. What’s the deal, what am I missing? i’m missing ONE letter from the croatian keyboard and it’s driving me ntus. it’s the letter ?. tell me quando quando quando? Visit stars21.com with your iPad. You will find lots of free online keyboards for 50+ languages.They include Arabic, Hebrew, Farsi, Hindi, Greek, Korean, Thai and much more.They also provide translators and dictionaries for 100+ language pairs. What about Bengali Indian language? Less than 10 languages is considered lots? What about the Icelandic keyboard? I can choose it on my iPhone, but it’s not on the list in my iPad.